So I got a comment accusing me of wanting historic designations for other’s properties but not my own. Yay a comment that isn’t spam. I’d prefer a critical comment over 10 comments selling snake oil and condos in Mumbai. What is it all about? Well there is an application with the Historic Preservation Office for the whole (with a few exceptions) block of Square 519, which is bounded by Florida Ave, 4th, R, & 3rd Streets. It is Case 17-18 Wardman Flats. The DC Preservation League, not I, nominated the block for Historic Landmark status. What does this mean? 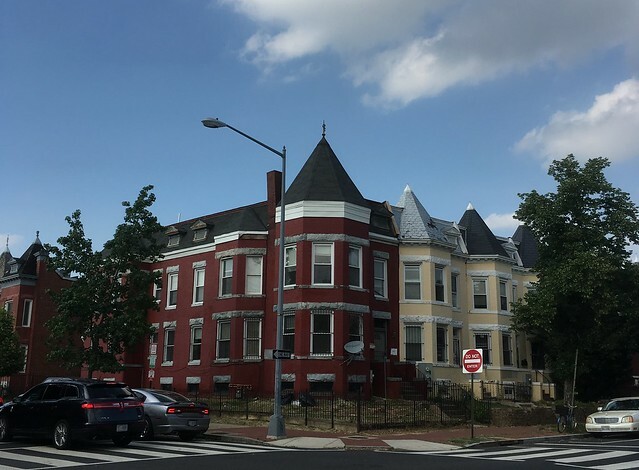 It means that the developer for 319 R Street can’t go forward yet and the turret on the corner is protected from demo by DC historic preservation law. I’ve been busy with a property in Baltimore, MD the past month, so I haven’t had much involvement with 319 R Street NW beyond a few blog posts, tweets and showing up at BACA meetings. I’ve been consumed by that (because of a bad contractor experience) and have neglected a lot of things here in DC. So what has happened with 319 R St NW and the rest of the block, was not of my doing. I will admit, proudly, that I did provide the tools for the application. There is a badly outdated website I created called TruxtonCircle.org . There you can find the census information for every man, woman and child who lived in the area known as Truxton Circle from 1880 to 1940. It has been up since 2012. A paper I wrote sometime ago, “Ethnic Divides in an 1880 DC Neighborhood” was referenced in the application. I’ve been researching the history of the neighborhood for well over a decade and sharing it, so if someone wanted to use it for other purposes, they can. But if someone tries to make Truxton Circle a historic district, I will fight them. I can totally understand if the residents of Square 519 are mad. They’ve been swept up in something stirred up by the developers of 319 R St NW. If they hadn’t threatened to raze the building, or if they had their architects create a second drawing incorporating the existing turret (as opposed to throwing a new one on top like an ill fitting dunce hat), it probably would not have come to this. The owner of 1721 4th St NW added a 3rd floor without getting the National Register of Historic Places involved and triggering something like this. But why drag everyone else on the block into this? Whelp… it appears to be a stronger case when taking the block as a whole because, with a few exceptions, it is a Harry Wardman block. So everyone else on the block has this hanging over them because the developers of 319 R Street NW threatened the corner turret. In this I’m like the person who provided the gun, but I didn’t shoot the guy. And if you’re wondering if I’ve left any other historic weaponry around for anyone to gather and use in an landmarking application, then yes, there is more. People of Bates Street, be aware.